The Brownstown Township Board met on Monday, January 30, 2017 at the Trustee’s Office. Those present were Trustee Jennifer Isaacs, and board members Bev DeWitt, Jack Gillespie, and Hope Warren. The meeting was called to order by Jack Gillespie. Jack read the minutes from the January 3, 2017 meeting. Minutes were approved as read. Jennifer read the minutes from the September 21, 2016 meeting. Minutes were approved as read. Hinnefeld Cemetery – The cemetery will be dedicated February 10, 2017. 2017 Salaries – The 2017 Salaries will be as follows: Brownstown Township Trustee $21,000; Brownstown Township Trustee Deputy $2,000; Brownstown Township Board Member $1666. 2017 Board of Finance – As of January 1, 2017 the account balance at The People’s Bank was $56,268.03. 2017 Nepotism Contracts – Resolution 2017-3: Signed by the Trustee and all board members. Resolution 2017-4 – The board signed and agreed to annually budget 10% of its estimated annual receipts to a local Township Recreation, Health, Culture, and Conservation Fund to help finance local cooperative town, township, and county “Healthy Community Projects”. Be it resolved the Brownstown Township Board annually budget 10% of its estimated annual receipts to a local Township Recreation, Health, Culture, and Conservation Fund to help finance local cooperative town, township and county “Healthy Community Projects”. Brownstown Township is currently participating in a Jackson County, Indiana CDC Grant project to help prevent and reduce obesity. The Township Board has proposed a resolution to yearly budget 10% of its estimated annual township receipts to a local Township Recreation, Health, Culture, and Conservation Fund to help finance local cooperative town, township, and county “Healthy Community Projects”. We hope that all of the 12 townships in Jackson County will pass resolutions to help fund these types of projects. This review of property ownership was researched and used to properly name a cemetery plot to be donated to Brownstown Township by Lynn W. Hinnefeld . This cemetery plot on the Hinnefeld farm near Wegan was named Lopp/Presbyterian Church Cemetery in the Jackson County Cemetery Book compiled by the Jackson County Genealogical Society in 1993. According to county records the cemetery property was first owned by the First German Old School Presbyterian Church in 1863. According to a document in the Deed Record/W/1863-1864/Part 1/Jackson County, Pages 67-68, on the 11th day of June, 1863 Barnard and Henriette Lorman, for the sum of seventy dollars, conveyed and warranted to the Trustees of the Jackson County first German Old School Presbyterian Church property to be used for church and graveyard purposes. That property was located in Section 36,Township 5, Range 4 of Jackson County, Indiana and described as: “Part of the Southwest corner _______of the Southeast quarter __of the South East quarter of Section Thirty six (36) Township five (5) Range four (4) Each containing Two acres (2)”. According to a document in the Deed Record/11/1875-1876/Part 2/Jackson County, Pages 348 & 349, on the fourth day of April, 1876 Frances Kopf, widow of Francis X Kopf, Deceased, for the sum of Forty (40) dollars, conveyed and warranted to the trustees of the 1st German Old School Presbyterian Church of Jackson County about one acre described as 10 rods east of the 2 acres deeded to the church on June 11, 1863 by Barney Lorman and wife as described above. Deeds provided by Lynn Hinnefeld in 2016 indicated both church properties above were deeded to Harmon Hinnefeld in 1894 and 1898. Those deeds were recorded in Deed Record/1898/42/Pages 381 & 389. Since many tombstones record deaths before 1876, the cemetery was consider a part of the original 1863 Lorman property and not a part of the 1876 Kopf property. There were no records to support the “Lopp” name used in the 1993 Jackson County Cemetery Book. That was considered a possible typing error for Kopf since F. X. Kopf is buried in the cemetery and Frances Kopf, widow of Francis X Kopf were both named in the 1876 deed. 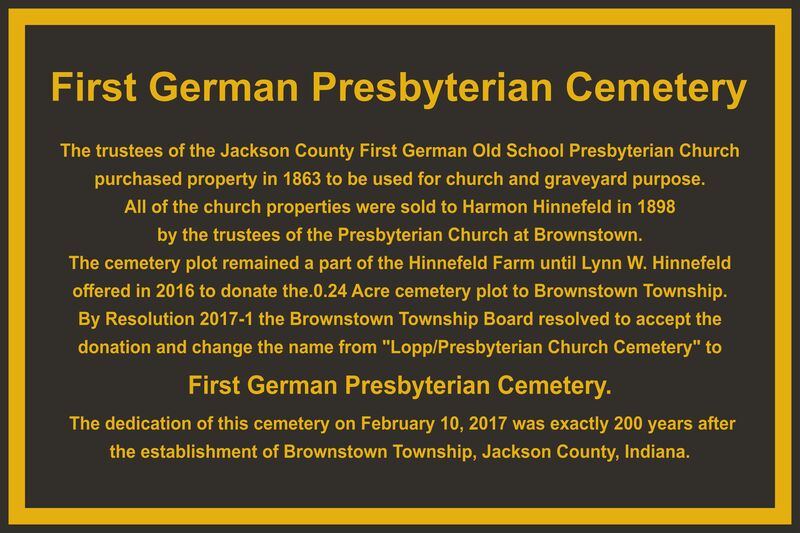 Considering the information above, the name of the cemetery when recorded in 2017 will be known as First German Presbyterian Cemetery. On October 19, 2016 Lynn W. Hinnefeld signed an agreement with Jack Gillespie, Chairman, Brownstown Township Board to allow the township to survey this abandoned cemetery in order to prepare a deed for this cemetery plot to be donated to Brownstown Township, Jackson County, Indiana. The meeting was called to order. Minutes of the last meeting were not available. Beverly DeWitt and Jack Gillespie were present. Beverly made a motion to keep the officers the same as 2016. The officers for 2017 will be Jack Gillespie, Board Chairman and Hope Warren, Secretary.